Yes, software vendors of security suites are really smart. They give you always advice to have the latest anti virus solution, and, last but not least, they suggest to use personal firewalls as one part of their complete suite as well. Unfortunately (software) personal firewalls permit always access for some "trusted" applications like your own browser. Very often they do not check if the browser is using original DLLs and of course they can't check if the permitted applications are remotely controlled by another application. So if a malware opens a browser in a invisible/hidden window, this malware can send commands (messages) to this opened (program) window with ease. Such a malware can send data via that hidden browser window, e.g. with a special formed URL or with the help of a html (input) form on a well prepared server. The personal firewall will not be able to forbid this. Ok, you ask me how a malware can do this, because you didn't download (yet) unknown executables ? Very easy. Just look for zero day exploits, preferrable also for your browser, like the newly discovered exploit here - http://eromang.zataz.com/2012/09/16/zer ... -over-yet/ ... works easily by using flash (I hate flash meanwhile, this ugly plugin isn't necessary anymore since HTML 5 was implemented). Hint: Using Firefox with "noscript" plugin would prevent getting such flash (look for "moh2010.swf") malware. Also, most of my 5 year old advices are still valid, see http://www.z80.eu/protected.html for more infos. That seems to be worth to be viewed... much background information about Gary Kildalls try to compete with Microsoft, we all know how it ended. 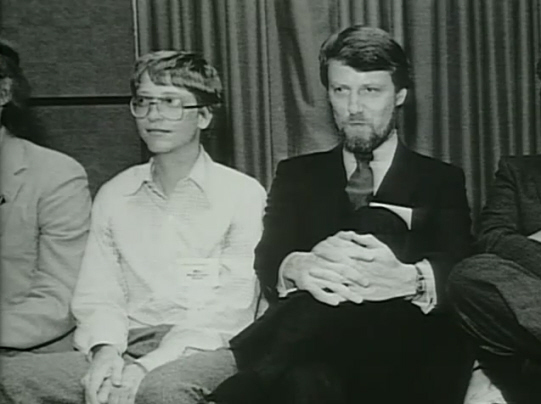 And this photo is an early picture of both protagonists. This is great. And it was not done with an ancient IBM PC/XT. 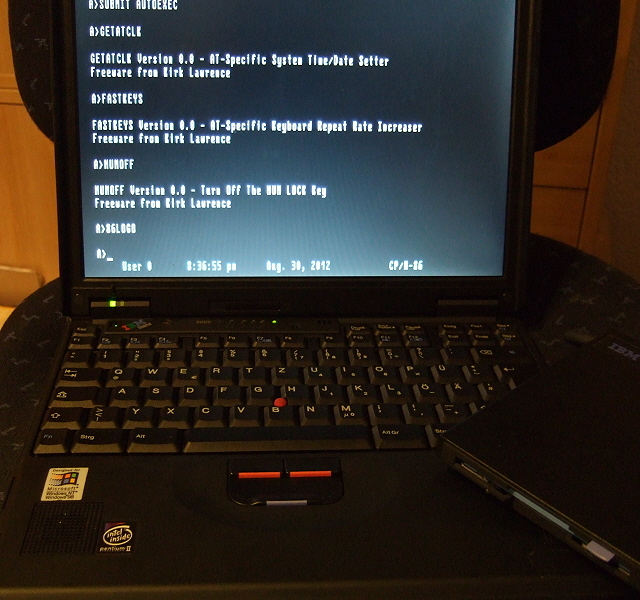 It was done with a Thinkpad T23 (not the most modern one, but still working with Windows XP, and having a build-in high density floppy disk drive ...). Somebody said there, CP/M-86 with missing magic bytes (0x55 0xAA) in its boot sector could not be used with other PCs except an ancient IBM PC/XT (or in best case, with an original IBM PC/AT). That's simply wrong (test it with the 1.44MB image file and the appropriate floppy disk writing program like RAWRITE, my DOS program writeimg or even David Dunfield's famous ImageDisk). Boot sectors from floppy disks must not have such a magic byte sequence at the end of the sector (instead, this check is only mandatory for harddisk boot sectors/an MBR on a HD). Btw. : My Compaq Portable II (an AT compatible machine) boots CP/M-86 also. Meanwhile I've access to a Thinkpad 600E. Of course I was able to boot CP/M-86, too. That's the proof "Crispmuncher" just has no idea what he talks about. 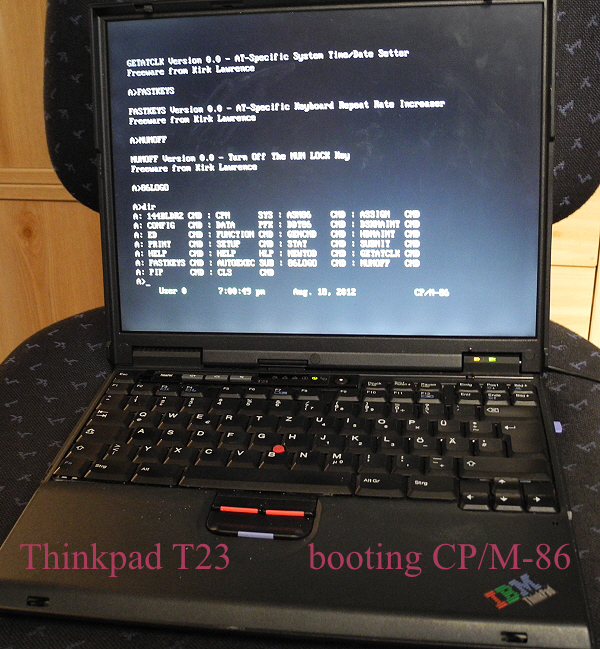 He told me he "tests" a Thinkpad 600E and he was not able to boot CP/M-86. I guess he has no idea how to transfer the mentioned 1.44MB floppy disk image onto the real floppy disk media.